Fields in dialogs and options to commands are not parameters. Parameters can contain expressions and variables. The most common Tscript Expressions are the tab() group, which fetch from DAT tables, and the chop() group, which fetch from CHOP channels. Parameters are also controlled by Exporting channels from CHOPs. 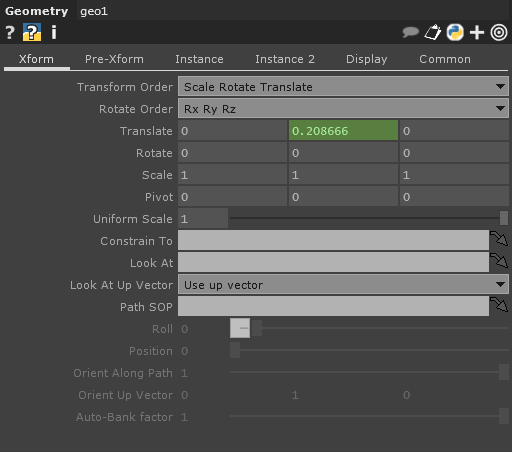 In the example Parameter Dialog below, the Y-Translate parameter is being controlled via an export. This is indicated by the green color of the parameter in the dialog. TIP: Pressing Ctrl-E/Cmd+E with the cursor in a parameter brings up the current parameter’s expression in the text editor, making it easier to see and edit long expressions. This page was last edited on 10 October 2018, at 16:25.